An example of a bunk trailer. Trailers give boat owners the flexibility of being able to transport their boats to a number of different rivers, lakes, inlets and bays. Of course, for most boats, you will also need a sufficiently powerful motor vehicle for towing, which usually means an SUV or pickup truck. For lighter aluminum boats, a sedan or similar-sized vehicle could work (with the proper outfitting). The two main types of boat trailers are bunk and roller; however, these types can have some variations. Bunk trailers typically use two or more long boards (or bunks) to support the keel (centerline of the hull) of a boat, with one board bracing either side. These boards are covered in a felt-like fabric, which helps prevent the boat from being scratched and helps the boat slide on and off the trailer. However, after a few seasons of use, you may have to patch up or replace this fabric. According to trlrs.com, bunk trailers are typically utilized for boats 20 feet or under when it comes to towing from place to place; otherwise (with larger boats), the trailers are commonly used only for dry or on-land storage. The terms float-on and drive-one trailer can be used as synonyms for any-sized bunk trailer, but more specifically they indicate a large bunk trailer that needs to be completely submerged in order for the boat to float or be driven on. With smaller boats and trailers, you can typically pull or winch the boat on to the trailer without having to back the trailer entirely into the water. According to trlrs.com, you should familiarize yourself with the ramp and depth conditions in a particular marina/harbor before you try to back in a float-on trailer and launch your boat, as often times there are rocks and other protrusions that can cause problems. Roller trailers utilize multiple sets rubber or plastic rollers to support the weight of boats. These rollers, which are sometimes mounted to pivoting bases, allow boat owners to easily slide their watercraft on and off of trailers. According to discoverboating.com, roller trailers are much more popular amongst boaters who are constantly towing their boats in and out of different waterways. Keel or chine rollers are wide, typically v-shaped rollers that are positioned along the center of a trailer, according jamestowndistributors.com. Like the bunks on a bunk trailer, they are designed to support the keel of a boat. Bow rollers and spool rollers are essentially extensions of keel rollers, as they provide support along the front portion of a boat's hull up to the bow. Rib or cluster rollers are smaller than keel rollers and are used to provide support along the outer portions of a boat's hull. According to jamestowndistributors.com, some rib rollers have treads or ribbing on them in order to increase traction with slimy/slippery boats, while others are slick to provide quick and easy launching. Rib rollers are sometimes used in conjunction with bunk trailers but are more commonly used with keel rollers on roller trailers. 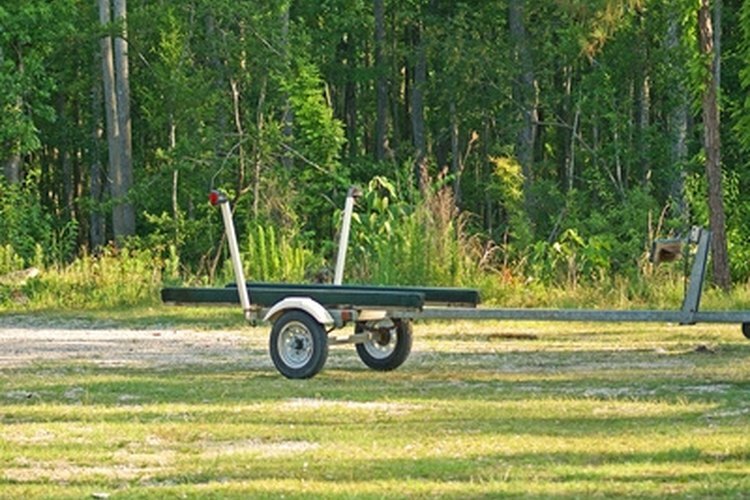 How Do Boat Trailer Guide-Ons Work?